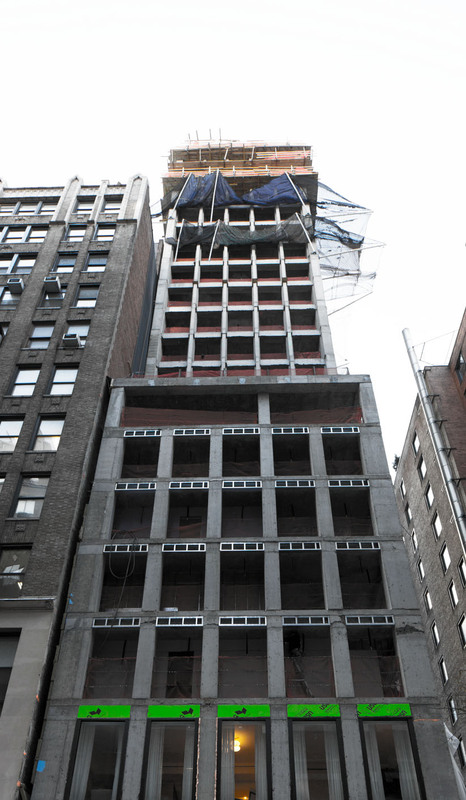 This “ugly duckling” of a construction site is about to turn into one of the prettiest buildings in Manhattan! Early on in New Orleans native Morris Adjmi’s career, he began collaborating with architect Aldo Rossi. The duo opened Studio di Architettura in 1986 in New York City and went about creating a notable portfolio of designs across the world. Some of their most notable projects include Disney’s Celebration Office Complex in Orlando, ABC’s Headquarters in Burbank, and the Hotel Il Palazzo in Fukuoka, Japan. After Rossi passed away in 1997, Adjmi opened his own firm, Morris Adjmi Architects (MA). Also based in NYC, they quickly became well-known for their designs that balanced modernity and contemporary thinking, all within context to their environments and surroundings. Hailed for the way they connect historic conditions, creative materials, and an industrial aesthetic, they’ve become a go-to firm for work in post-industrial neighborhoods and historic districts. Their insistence on including elements that promote sustainability, such as living walls, repurposed materials, and green roofs, also help them keep an eye on the future while they work within the context of the past. In New York City, MA has worked on all kinds of buildings and projects across Manhattan and Brooklyn. Their work includes two NYU School of Law buildings, restoration of the Provincetown Playhouse, and multiple projects in the Meatpacking District. When developers Ekstein Development Group and Pinnacle Group decided they wanted to build a luxury condo tower at 30 E 31st Street in NoMad, they brought in Morris Adjmi Architects to design it. Inspired by the iconic Manhattan skyscrapers of the 1920s and 1930s, including the Kaye Building at 105 Madison Avenue and Remsen Building at 148 Madison Avenue, the end result is a staggering work that blends modern tastes with the Neo-Gothic and Art Deco architecture that came before it. The 40 story, 470-foot structure might share some DNA with its forefathers but it quickly forges its own path thanks to a simple but distinctive lattice crown that might remind you more of a Gothic Revival church than of a condominium building. That motif continues across the entire tower, from the doors to the windows and lights. It’s as if someone took the classic New York City skyscraper and completely modernized it. At the ground level, terracotta pillars rise upward and help to give structure to the brass-framed windows that make way for the crown. Inside, the luxurious lobby comes curated with art and stylish furnishings. Marmorino Venetian plaster walls provide a delicate contrast to the hexagonal tile floor. Residents returning home can marvel at the space while they speak with the 24-hour concierge or make their way up the elevators to their residences. All residences at 30E31 take full advantage of their place in the heart of Midtown Manhattan. Floor-to-ceiling windows not only bring in glorious light but also give you every opportunity to appreciate the stunning views surrounding the building. Depending on direction, you’ll have a prime view of the Empire State Building, One World Trade, the beautiful skyline surrounding Madison Square Park, or perhaps all of them and more. Interiors boast seven-inch wide white oak floors and beautiful millwork throughout the unit. Kitchens come complete with custom Italian cabinets of warm walnut that complement the Perla Venata quartzite countertops and backsplash. Bosch, Wolf, and Sub-Zero appliances are integrated into the space with seamless precision while luxury fixtures designed by Adjmi complete the space. The first thing you’ll notice in the master baths is the marble slab walls and countertops. After that, you’ll take in the custom European white oak vanities as well as the other custom touches and fixtures created by Adjmi just for 30E31. Showers and private water closets are enclosed in tasteful glass frames. The Neo-Gothic design that influenced the building’s exterior comes back into play in hourglass marble tile floors. Between the second and eighth floors, you’ll find 13 one-bedroom residences that start at 866 square feet apiece. Starting on the ninth floor, a 1,677-square-foot two-bedroom condo takes up the entire space, enjoying the accompanying views. At the very top of the building, however, you’ll find the 3,354-square-foot three-bedroom duplex penthouse with 360-degree views through the zigzagging, angled exterior design. Life in 30E31 certainly comes with perks, many of which are available as amenities inside the building. The resident lounge, which overlooks a viewing garden, provides a comforting and tranquil respite from the world outside. Relax in opulent furniture surrounding by stone walls, white oak floors, and a limestone fireplace that warms on two sides. For intimate gatherings and special events, a private dining room and the en-suite kitchen becomes an extension of the resident’s home. It’s perfect for hosting dinners, whether they’re important business meals or casual gatherings among friends. When it’s time to break a sweat, the fitness center provides plenty of options for a solid workout. State-of-the-art cardio equipment, strength-training equipment, free weights, and a dedicated area for yoga or stretching gives you plenty of options to stay fit without worrying about gym fees or crowded machines. The extra bonus of using the center is the natural light that pours in from the landscaped garden just outside. Much like New York City itself, the neighborhood of NoMad (North of Madison Square Park) has evolved many times. A mid-19th-century hub for leisure and dining, it also features various private brownstones and mansions that still stand today. Over time, architectural styles changed and grew upward, from Second Empire to French Renaissance Revival to the modern mid-rises of today. The neighborhood has also regained a reputation as a true design district once more after fostering that image nearly a half-century ago. Any resident who wants to indulge in their condo’s design won’t have to travel very far to find luxury furnishings. Design stores such as B&B Italia, DDC, Suite NY, and Dover Street Market are all within blocks of 30E31. High-end furniture companies such as Aero, Desiron, Dune and Lobel Modern all have local stores as well. The location also puts you within walking distance of some of the finest restaurants and eateries (Wolfgang’s Steakhouse, Eataly, Hanjan), shopping experiences (Bonobos, Opening Ceremony, Lacoste), and cultural hotspots (Empire State Building, Flatiron Building, Madison Square Garden) in the city. As it stands, there are five units in 30E31 still looking for a first buyer. They range from a $1,600,000 for a 741-square-foot one-bedroom on the eighth floor to a 1,667-square-foot two-bedroom on the 28th floor asking $4,350,000. The available units also include the aforementioned 3,354-square-foot three-bedroom duplex penthouse. With private elevator access, three-and-a-half baths, a pantry, and wet bar, this top-of-the-world living experience is looking for $12,000,000.